Has anybody grown Ficus religiosa in Sydney or further south? Does it do well? Any tips? 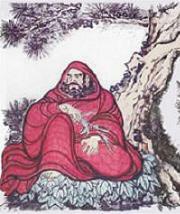 Looking at you Bodhidharma! mate not actually having been down there this might not be helpful but honestly, if you can keep the frosts away from the tree then you shouldnt have drama's! Im positive Leong grows religiosa without to much issue. dont know if he worries about frost either. Thanks Jamie. I figured i was fine so long as i avoided frost but i know it's quite different from most Ficus. For instance, it is difficult to prop via cuttings. mate, I have had problems with a lot more ficus cuttings than people would imagine with some just refusing to strike no matter what was done! as easy as they do propagate things can be finicky sometimes, like one prob I had was the medium staying to wet (it was organic) and rot sets in, although I even had some fig cuttings rot in diatomite! all ya can do is keep trying, using aids to help like hormone powder and vitamins etc. being that the F. religiosa is some what more "tender" I guess you could say you might just need to be a little more pampering with it. let us know how you go any ways champ! I do have one going Joel. You are correct that cuttings are difficult as is seed ( i have tried both) Mine has to be glass house accommodated over winter and also suffers from black spot. I treat it the same as the rest of my Ficus. 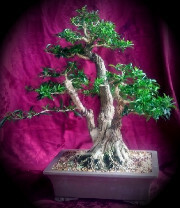 I have yet to see an impressive one as a Bonsai here in Aussie but there are impressive ones o.s. They do grow strongly though, tripled its size in one growing season . Air layering will be my next effort with this tree. I think i may try my tree in the ground come spring, and drape some sort of plastic over it in winter on particularly cold nights. I'm keen to get it growing strong and then make some chops. It is only a tiny struck cutting now. Hope it makes it through winter! P.s. Diederik the elm is going well. Has lost all it's leaves and needs some cutting back. I have given it a year of thought and am still too scared to make any serious chops. I still can't even figure out what front is best! I think i may have to start a thread on here asking opinions. I agree with above posts. I used to strike F. religiosa cuttings in India (its native country) without any problems, but in Sydney they kept on dying. When I finally succeeded it was a combination of the right cutting size (has to be a woody cutting), appropriate season (has to be warm, but not too hot) and the use of root hormones. I have a question though. I stuggled to find a tree in Sydney to get F. religiosa cuttings from. Does any one know a tree in Sydney where I could get more cuttings? There is a massive one growing in the grounds of Sydney University. I couldnt believe the size of it, until I saw it. I have an old small one in a pot which I can take a couple of cuttings in the spring if people are interested. G'day Joel, i made a small glass house out of old windows, you can use aluminium, and draped an piece of plastic over it during winter. I just sat it over the tree in the ground. I have wondered about the Elm and i am glad to hear it is still alive If the only problem is uncertainty then i am happy. I agree, post it and get a thread going on it and all will be resolved. I look forward to seeing it again. would love to see it edward!! always love seeing old figs! Apparently there is a F. religiosa in Hyde park and there is one at the Royal Botanic Gardens in Sydney but you can definitely not reach it's foliage (plus cuttings aren't allowed). I already have a struck cutting. It was given to me Wednesday. I just want to make sure i don't kill it! Diederik, the tree is definitely healthy. I was surprised how much it growth it put out after being bare rooted. I want to get stuck into it, it's just that i don't want to regret anything i do this tree as it is one of my largest trees. The Bo tree in the Sydney Botanic Garden is right over on the eastern side beside the Lion Gate Lodge. At this time of year (late summer, early autumn) it gets covered in small brownish purple figs which seem to grow right out of the stems. Cockatoos seems to love them but prefer to break branches off and sit on the fence eating them. They then discard the broken branches on the path _outside_ the garden fence. I am trying to strike cuttings from a few of those at the moment, though it is probably not the best time of the year for it. PS I have got two cuttings to strike from pieces I picked up off the footpath. They are in a small greenhouse I bought from Bunnings. It comes in a box with plastic tubes that you put together to make the frame and metal mesh shelves. Then there is a clear plastic tent that goes over it with a zip up the front. I have been growing religiosa here for last three years. One batch in greenhouse and one batch outside (500 in and 500 outside). The ones outside have handled many frosts. Last week for instance saw trees covered in ice 3 days straight. After reading the net for lots of growing information in relation to the cold I was thinking I was wasting my time with the trees outside ....but they are thriving. They are actually doing better than greenhoused trees. They are definately hardier than the internet suggests. Cuttings will work almost any time of year. If taken this time of year, keep the greenhouse warm and humid and if possible a little bit of bottom heat. When timing is less than perfect, the bigger cuttings seem to work better.